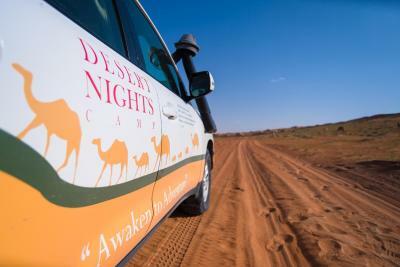 Lock in a great price for Desert Nights Camp – rated 8.9 by recent guests! 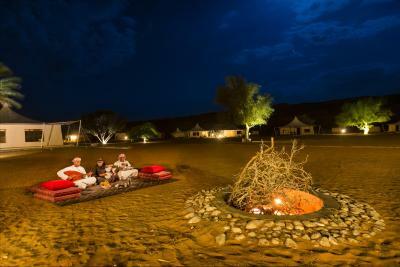 Our stay at Desert Nights Camp was fantastic. We were initially unsure about turning off of the main road, but afterwards, there were several signs, making it clear that we were headed in the right direction. Everythjng was well organized, and the room was very clean. 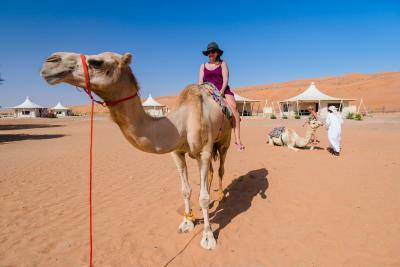 We really enjoyed the sunset experience up on the dunes and the short camel ride the next morning. The dinner and breakfast were also great (good variety and very tasty). We were only there for one night, but in hindsight we definitely could have spent another night or two. Extremely happy with our choice, and can highly recommend! 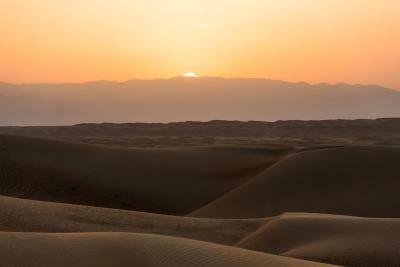 Sunset on the dunes above the camp was great, generally friendly, helpful staff. 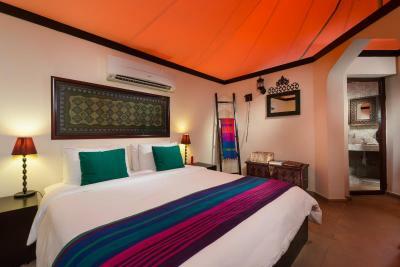 Nice tent house with everything you need; very good dinner buffet with BBQ; amazing sunset view from top of the dunes. Everything. 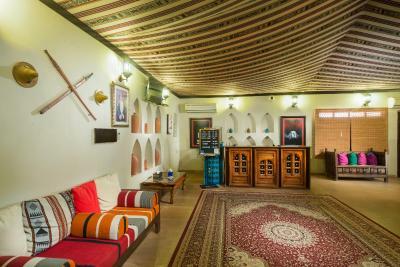 Beautiful and comfy rooms, great food, especially the romantic shuwa dinner in the dunes, dune buggy riding, sunset views, sandboarding, service, staff. Location in the middle of the dessert it was very beautiful. Rooms were great, and a nice touch was that there was no TV. Really had a relaxing time. This is a great place! Our only mistake is that we only stayed over night. 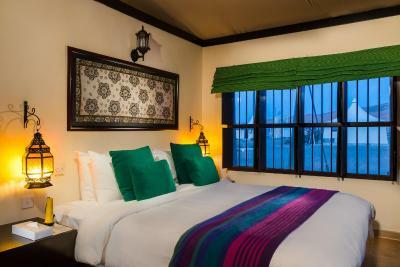 If you go, stay for a least two nights to really enjoy all that they have to offer. Plenty of activities but not touristic. 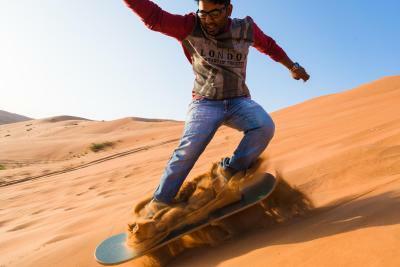 The staff adapts to your needs and times and all activities are pretty much customizable for a price(!). Big bedrooms, clean and quiet. 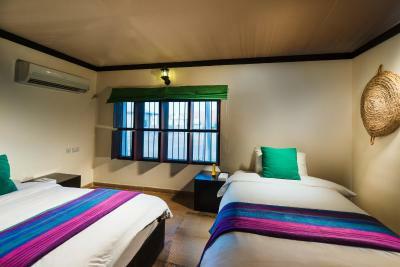 The rooms are well appointed and charming. 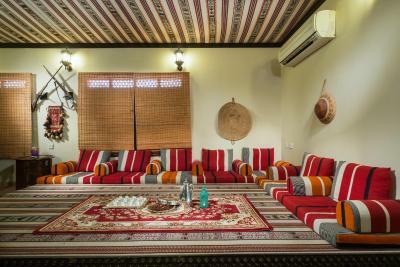 Set apart for a private feeling, while part of a village. 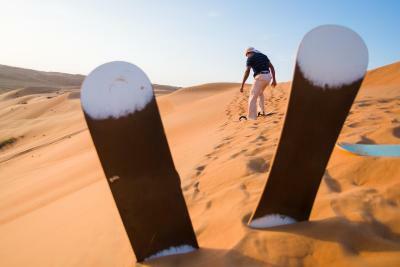 And, of course, on the desert floor between the towering dunes, so you really are "in" the desert. Accomdation was nice inside . The staff were friendly , BBQ was great. With an unbeatable setting in the silky dunes of the Omani desert, the 5-star Desert Nights Camp offers 39 luxurious Bedouin-style tents and 14 non tent standard rooms for those seeking the ultimate desert adventure holiday. 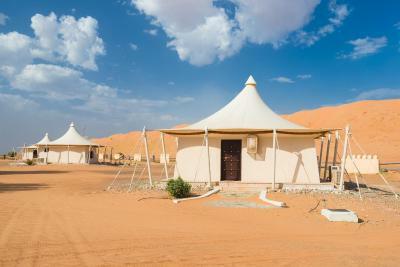 The Desert Nights Camp is located on the Wahiba/Sharqiya sands, a 2-hour drive from Muscat. 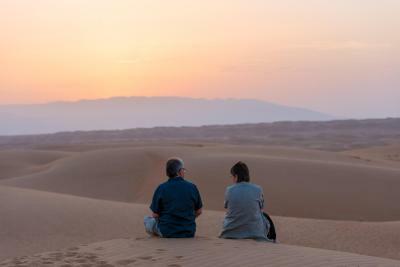 This secluded area covers 6.8 mi of beautiful desert landscape. 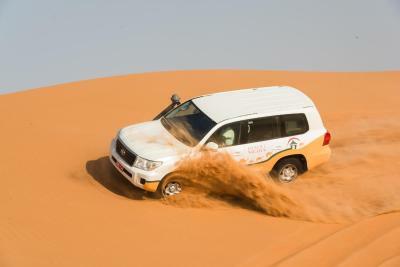 Several free services are offered to the guests, including drive up to the dunes in a 4x4 vehicle to watch the sunset, with light snacks and soft drinks served on the trip. 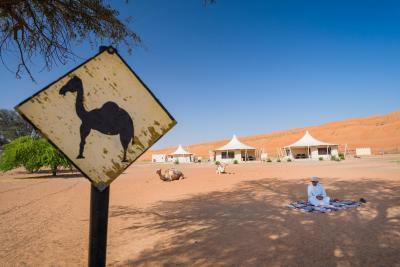 Also camel rides within the camp premises in the morning are available, and transfers between Al Wasil town and the Desert Nights Camp are offered for those traveling by vehicles not suited for desert driving. 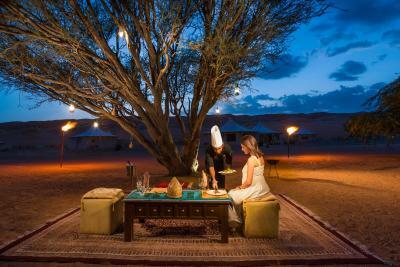 When would you like to stay at Desert Nights Camp? 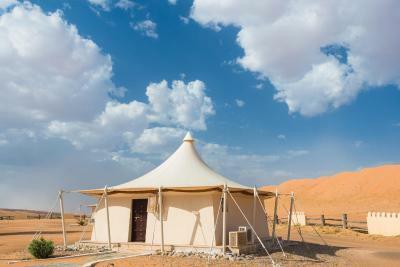 Featuring a panoramic view of the Wahiba Desert, this tent offers a bedroom with a Single bed surrounded by a canopy. 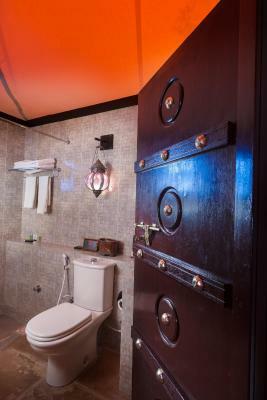 It has a separate living room, and there is a private bathroom with a shower and hot and cold water. 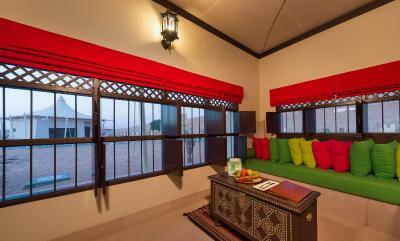 This room offers a panoramic view of the Wahiba Desert. 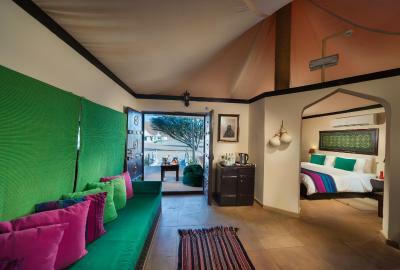 It has a living room and bedroom with a double bed surrounded by a canopy. 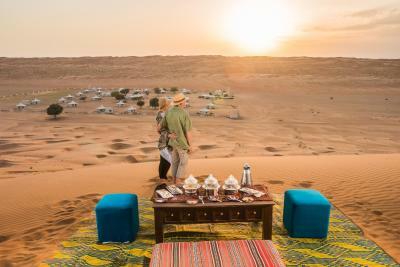 “Ahlan Wa Sahlan” – Awaken to Adventure Desert Nights Camp, the only luxury desert camp in Oman, is an ideal base for your Arabian desert adventure, with spectacular craggy mountains in the distance, endless dunes and crystalline wadis. 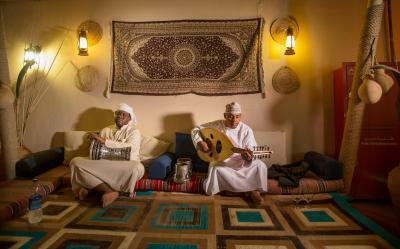 It is only a two hour drive away from Muscat, the capital of the Sultanate of Oman. 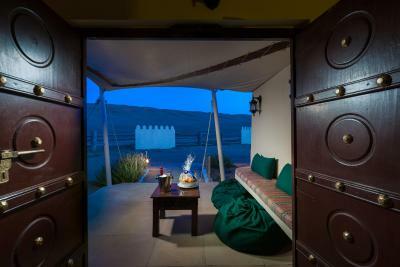 The camp is sprawled across 10-acres of silken sands, secluded 11km within the vast isolation of the Omani desert. 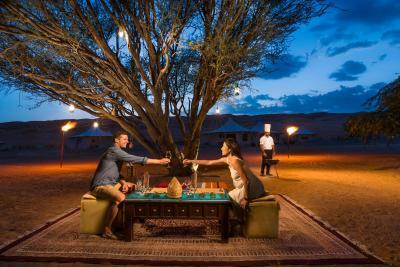 House Rules Desert Nights Camp takes special requests – add in the next step! All children under 12 years are charged OMR 35 per night for extra beds. 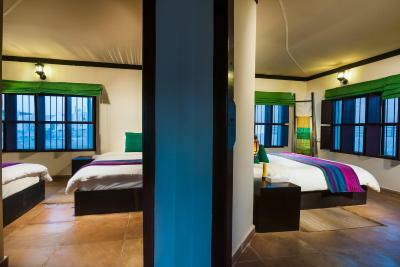 Any additional older children or adults are charged OMR 45 per night for extra beds. 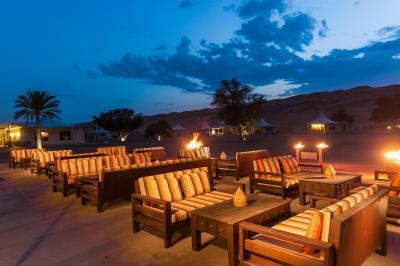 Desert Nights Camp accepts these cards and reserves the right to temporarily hold an amount prior to arrival. 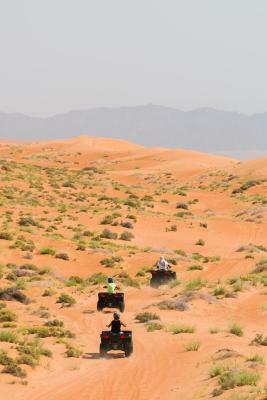 Please note that camp is only accessible by four wheel drive. Complimentary transfer can be arranged for guest (without 4WD) to the camp from Al Wasil Petrol Pump until 16:00 hrs, provided prior notice is given to the camp. After 16:00 hours, the guest will be charged OMR 25. We were glad that we had not booked a second night, as there is little to do except the expensive tours. 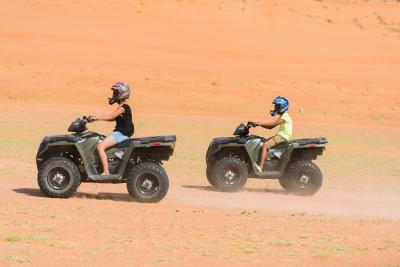 In fact, the noise of the quad bikes was very noticeable for people just wanting to sit & read. There is no pool (would be hugely expensive to run one), so you need to be able to entertain yourself. Alcohol cannot be consumed in the public areas, including the restaurant. 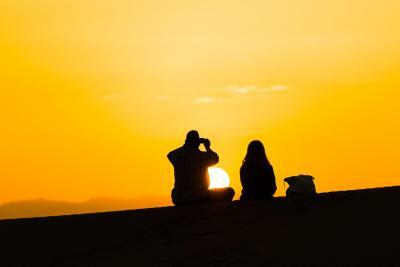 Watching the sun set over the dunes was very relaxing. 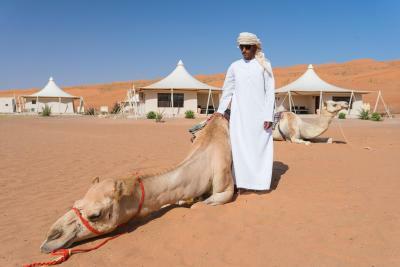 My husband especially enjoyed the included camel trip. Excellent buffet for both supper & breakfast. The 11km drive out to the camp is well signposted, easy to do in a car with fat tyres (and possible in a normal saloon if you are experienced & your insurance permits). There are even pins on Google Maps. 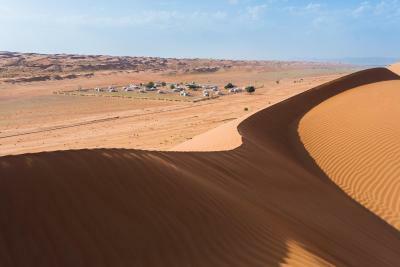 We have been to similar desert camps (e.g. 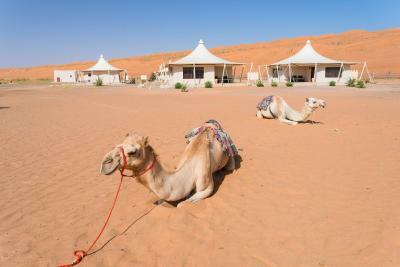 Wadi Rum in Jordan), and this was a far superior experience. For example the music at supper was live musicians playing traditional instruments (although back a the tent, the less subtle music from the adjacent camp was more prevalent). The food wasn’t great, and the staff could have been more helpful and welcoming. Amazing location. Enjoyed the excursions and overall experience. Amazing location, very attentive staff, dinner was excellent! It gives you the feeling that you are right in the middle of the desert. Completely worth it! The Sunset experience was fantastic! Breakfast is more or less always the same in these kind of locations. Ok but nothing special. Some noise in the evening from the other camp which is 200 meters (or a bit more) further. 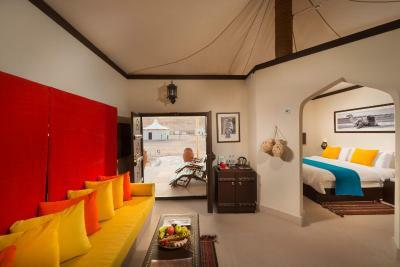 Very nice luxurious camp in the desert. 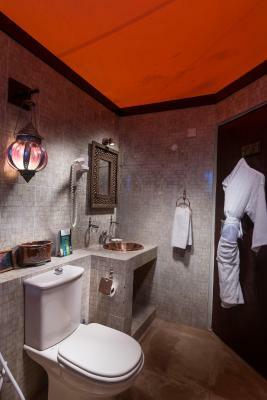 Very nice room and bathroom. Dinner could have been better,it was OK but maybe it was their interpretation of Arabian food that did me! BBQ meat was overdone. Should have told ladies to have a scarf over their head and hair when on the dunes,wind = sand in hair! Activities become rather expensive, if you want to do more than one. At dinner, salads & desserts were good, but main courses were very moderate. Excellent location. Stylish and well designed site. 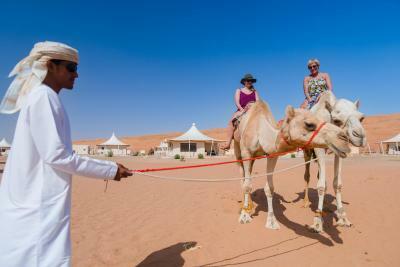 Good experience of the Omani desert for the tourist, without roughing it. Range of activities. Staff very helpful. A la carte lunch was very good. Everything was great! Including the activities. Will return again! Music from neighbouring camp but not too loud or late.